Does re-doing a performance revive it for a new audience and social context, or does it die as a result of the weight of the memory of the first attempt? For that matter, why do any of us consider remaking a piece of art: to relive a success; repair a failure; or as an easy way out? How does a change of atmosphere inform, infect, cloud and/or derail a do-over? Every space, every moment, and every audience has it's own history, present state, and potential of the future. 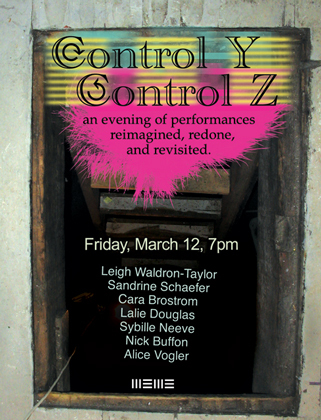 Control Y Control Z is an investigation of how changes in environment, witnesses and memory can set an old performance back into a state of evolution.